I’ve been back and forth on this subject for a couple of weeks now, but I’ve finally found the time to sit down and work out just what I’m doing with my Tyranid/Genestealer Cult army. Remember this? 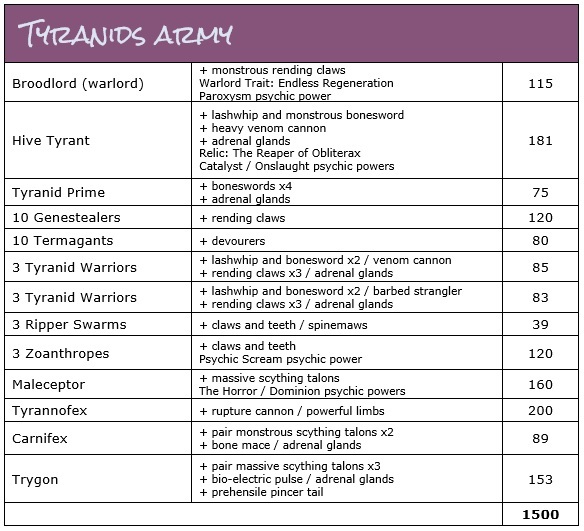 Tyranids are an army that has appealed to me almost from the start, but I’ve always had something else going on. For 2018, however, I decided to throw my lot in with the bugs, and finally set about creating a Tyranid army. However, I’ve already found myself losing interest in such an enterprise, despite having bought so many of the blighters! I’ve had some bad experiences in assembling a carnifex and a tyrannocite, so thought it might be better to start where this really all began for me, with the Genestealer Cult. Cultist models have really caught my imagination since their release in the Deathwatch: Overkill boxed game a couple of years back. I picked up the game, of course, and when the range was introduced I did get myself a couple of extra bits, though I’ve been really slow at building them up. Well, no more! 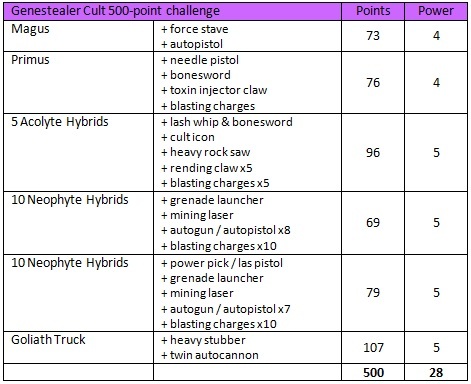 I’ve worked out a small, 500-point list to start with, and will be working on that for the next month or so as a foundation to a larger Cult force. It’s probably not going to be the most competitive list out there, but who cares – I’m excited to put it together and get it painted, which I think, in this specific instance, is the most important thing right now! 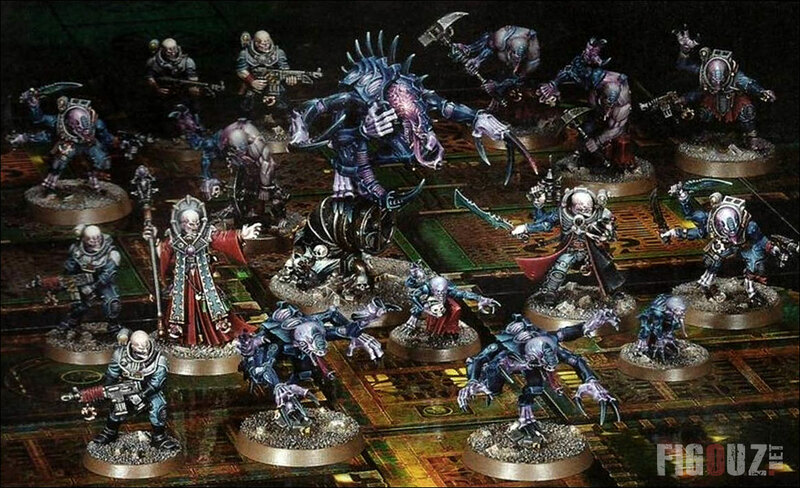 It uses the models from the Overkill box as a basis, though the Acolyte Hybrids are from the separate squad box released afterwards. In my Ambush! blog, I talked about how good a basis Overkill is for a Cultist army, though I’ve since gone through all of the models in there and notice that the squad sizes are a bit weird: two squads of six Acolytes (which are a minimum of 5 per squad in 8th Edition), and two squads of eight Neophytes (which are a minimum of 10 per squad). I’ll probably be raiding the bitz websites to see if I can bulk these out soon! The Neophytes are probably my favourite kit in the whole range, and I think I’ll likely be looking at doing more of these in time. For now, I’m mainly using the Overkill miniatures as I already have them built, and eight of them have actually been painted to some degree. However, this list may well change soon as I decide to add in models from the Neophyte kit in due course. The important thing, though, is that I start getting this army on the road. So, by the end of February, I intend to have all 531 points fully painted – I may even have gotten in a couple of games with them by then, as well…! Make sure you come back to check on my progress! And remember, I usually post up what I’m doing over on instagram as well, feel free to check me out there in the meantime! Author spalanzPosted on January 23, 2018 January 24, 2018 Categories WarhammerTags Genestealer Cult, new army, Tyranids, Warhammer 40k4 Comments on Cult Uprising! It’s my 700th blog post! Crikey! It’s this last army that I want to talk about briefly today. I’ve got a bunch of kits, along with the stuff from Deathwatch Overkill, that has been in varying stages of completion for quite some time now. I know the colour scheme that I want to use, both on the mining Cultists and the guardsmen Cultists, and I have a vague idea for including a detachment of Tyranids in with them now that I’ve been delving into Index: Xenos 2, but it’s finding the time to work out a proper army list that is proving to be difficult right now! 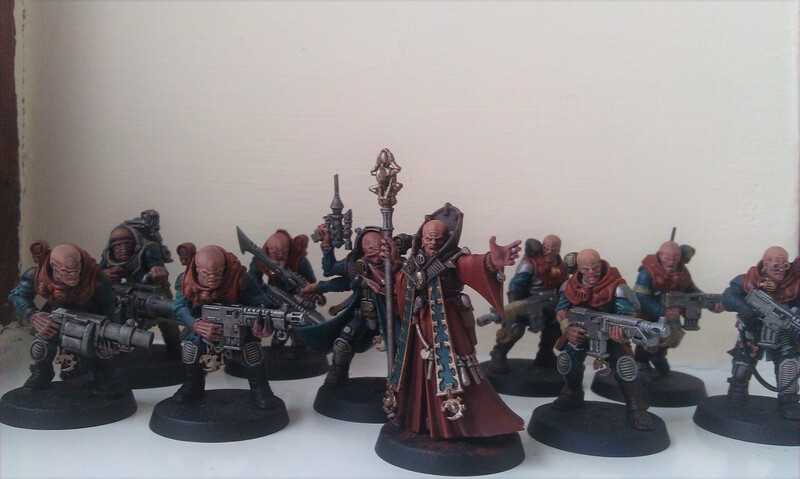 So far, I’ve decided that I want to have a core of actual Genestealer Cultists for the army, and I’m probably looking at a Battalion detachment, given the number of HQ units that I’ll be doing for these chaps. My big plan is to then have waves of Neophyte Hybrids much like in the picture above, though on a much larger scale. I think I want to get at least two more boxes of these guys – to add to the one box I bought last year, and the contents of Overkill. 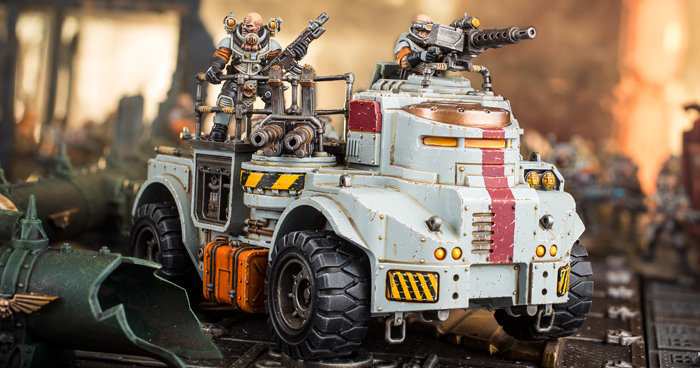 Incidentally – how good are the contents of Overkill for starting a GSC army?! According to my calculations, the total points cost for the models you get in the box, for 8th Edition, is 809 points. 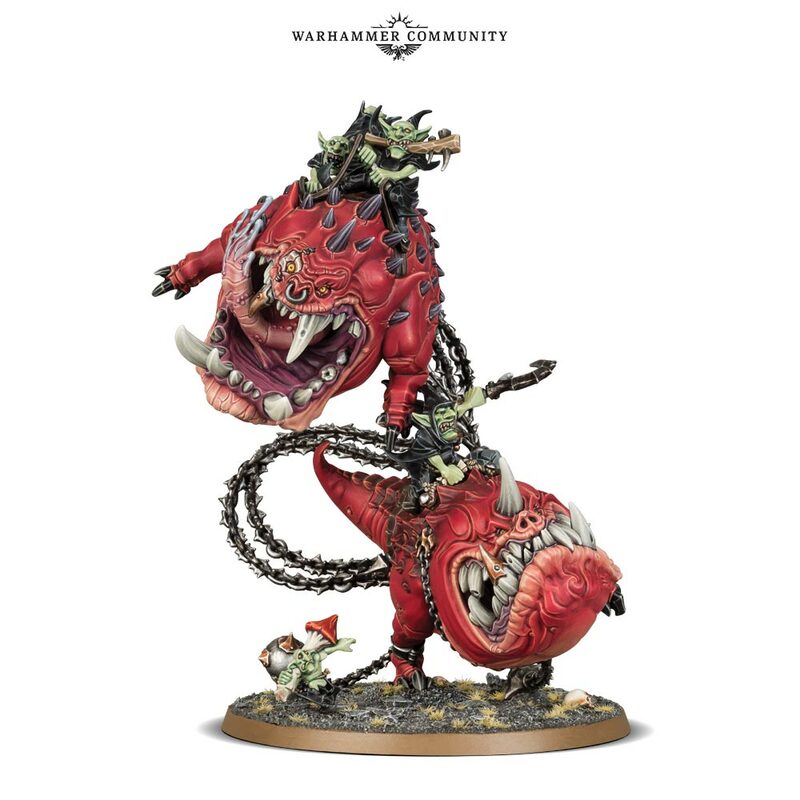 Now, that does assume a squad of 5 purestrain genestealers, and not the four that are supplied, but it’s otherwise a very good start to the army. I was initially a bit bummed that GSC don’t yet have a Start Collecting box for the faction, but I actually feel that Overkill is such a good place to start, it’s a lot better than a Start Collecting box will be. Though, you don’t get any transports in the boxed game, of course. The squad that I built up just over 12 months ago now works out at 106 points, by my reckoning – with the weapons forming almost half of that cost. 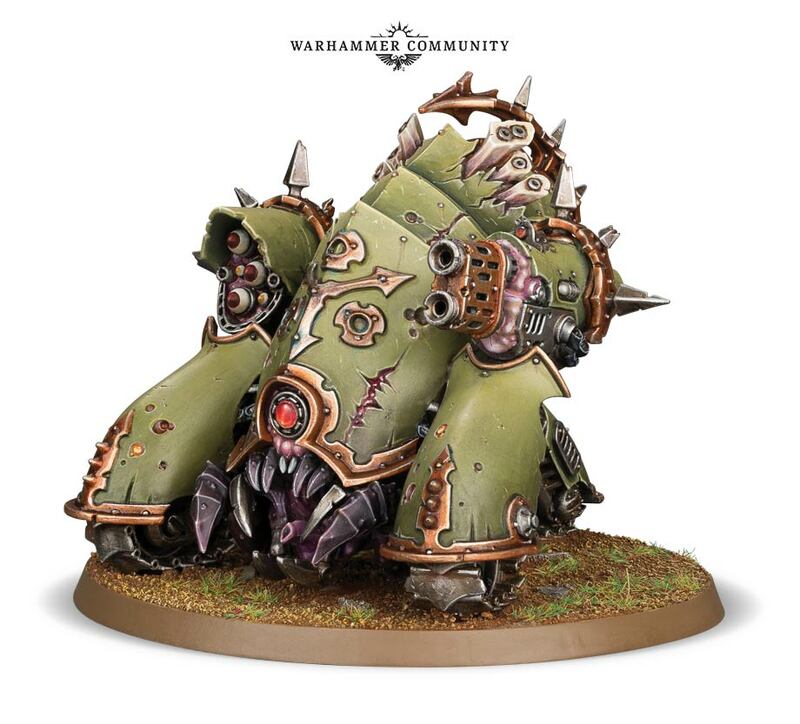 Now, I have 5-man troop squads that have quite a high cost, and something I’ve been thinking about when building my Imperium army has been keeping the cost down in order to get more bodies on the ground, so I’m surprised at just how expensive these things can turn out to be. The modular flavour of building a 40k army is something that I really enjoy, and drilling down to that level of precisely what I can kit out my guys with is always a lot of fun for me. Especially given how restrictive my first army, Necrons, can be! So I don’t think I’m ever going to go for a boring, basic squad, but I do feel somewhat bad about including such expensive wargear in just one squad! 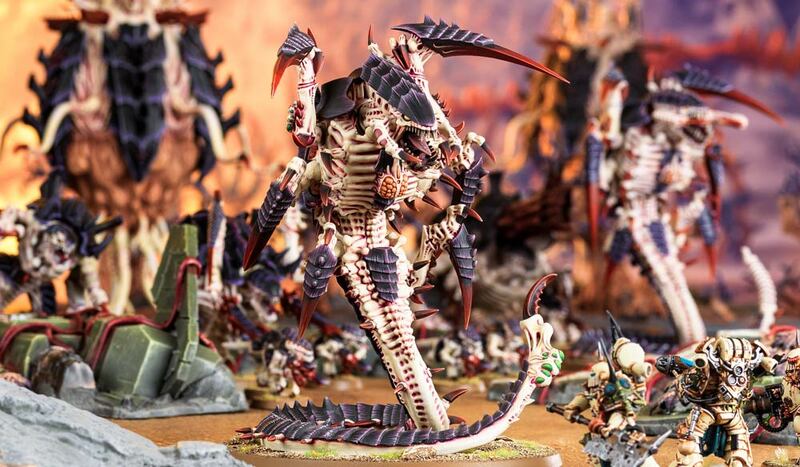 The Tyranid detachment is something that I’m very much looking forward to adding, as it’ll finally give me the impetus I need to get painting these chaps! I love the look of the Zoanthropes, and have been looking forward to getting them done for a while now. 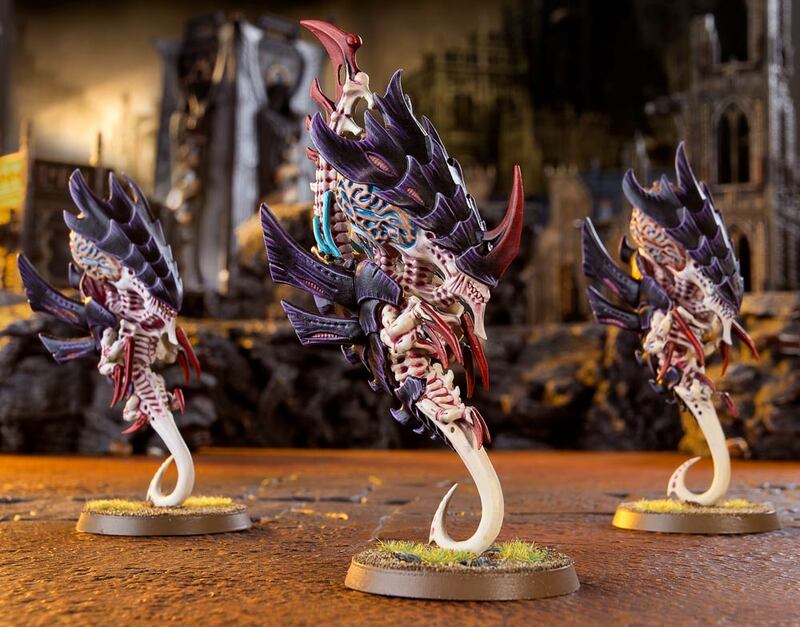 I’ve been thinking about adding these in a Vanguard detachment, just because there are more Elite units of Tyranids that I want to add to the army than anything else. I definitely want to build up my Maleceptor for the list, and add some Venomthropes (along with a Toxicrene in the heavy support slot). 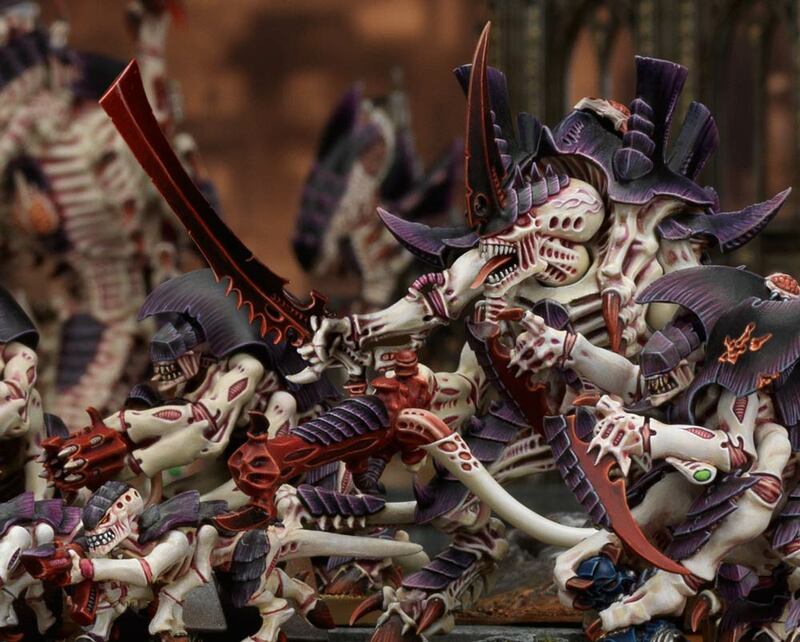 It would be more thematic, however, to build the list around a Broodlord and Genestealers, which are troops in the Index, so I suppose the idea of concentrating on a Vanguard because of the Elites really isn’t quite so limiting. Anyway, I thought this blog would be a short one, but clearly not! Tyranids and Genestealer Cultists always intrigue me greatly around this time of year, so I expect to be talking about them more as the autumn goes on. Thanks for making it this far through the post, and here’s to the next 700! Author spalanzPosted on October 18, 2017 October 18, 2017 Categories WarhammerTags Games Workshop, Genestealer Cult, Tyranids, Warhammer 40k6 Comments on Ambush! 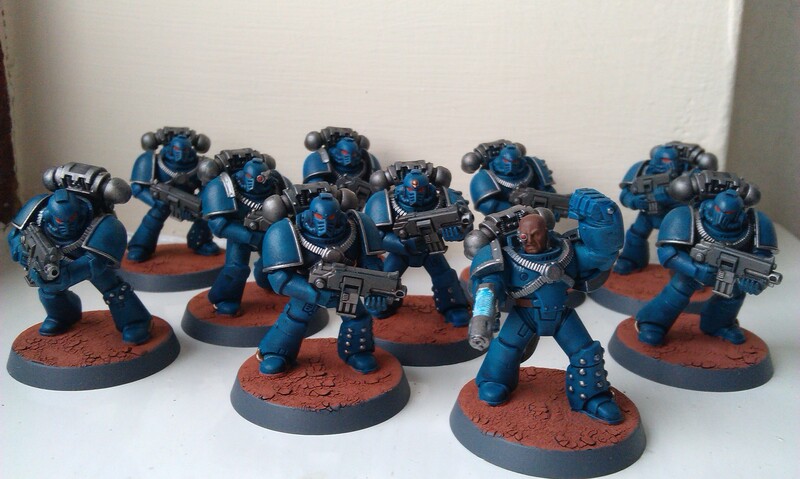 My ten-man tactical squad for my Horus Heresy Alpha Legion is now complete! I have to be honest, I’ve really given these a bit of a rush job – which isn’t all that bad, as the scheme isn’t exactly complicated. But I could probably have taken some more time on these things than I ended up doing. That said, there are also some elements where I’ve taken the time for some details, such as the plasma pistol, adding a hint of the pale blue in the muzzle as well as on the coils. Overall, they’re a serviceable tactical squad, and I’m glad to have them done. Especially as I’ve met the pledge of getting them finished in two weeks! One squad down, one to go. I think my second mandatory troops choice is going to be Assault Marines, which means FW resin, but I’ll cross that bridge when I come to it. The rhino is the second project I’ve been working on this week, and I have to say, I’m not really that sure about a lot of it. First of all, I mentioned last week how the chassis has turned streaky in parts because of the Drakenhof Nightshade – I’ve tried to do some kind of overbrushing with, alternately, Teclis Blue and Sotek Green again, and while it has helped with some of this streakiness on the top, it is still an issue. However, it’s gotten to the point where I’m thinking I’m fine with the overall look – it’s kinda blotchy, but more importantly, it’s pretty much the same as every marine in the army, so I can live with it. For the headlamps, I’ve painted the bulb with White Scar, then gone over it with Cassandora Yellow to add some depth of shape. I then lightly brushed on some Yriel Yellow, not just on the bulb but also on the surrounding hood and in a cone shape out from the base of the lamp, and finally added some Flash Gitz Yellow as a highlight here. The photo above doesn’t really show it, but I think on the tabletop, the effect is actually pretty cool – even if I do say so myself! 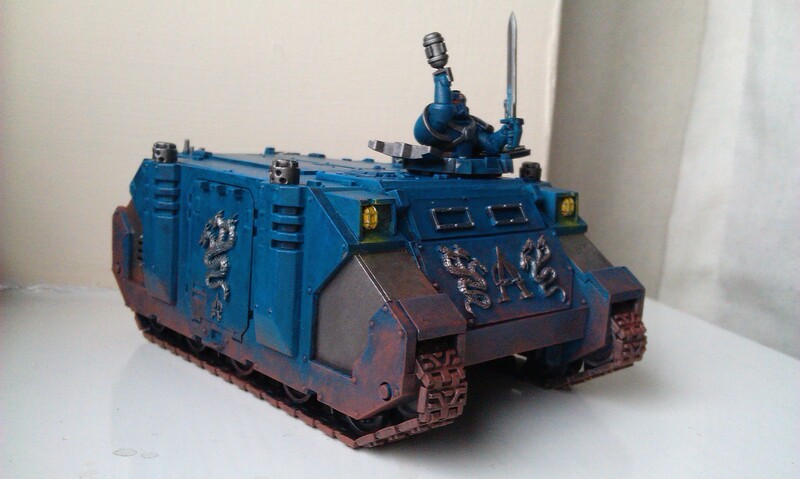 Of course, this is my first ever attempt with weathering a miniature, and I wanted to tie it to the rest of the army by adding some rust-coloured mess to suggest the tank is moving through the same battlefield as the troops. So I’ve stippled on Tuskgor Fur after speaking to the manager of my local GW, and I think, for a first attempt, it is actually pretty decent! I still want to do something more to it, as the Fur doesn’t really look much like Martian Ironearth, but I’m afraid of going too far, so have called a halt for the time being. I’ve also added in some Martian Ironearth to the rear tracks in an effort to make it look like those tracks have clogged up a bit. Overall, it’s perfectly serviceable I think. I do want to try and get better and improve, and after showing it off to some folks at the store, I’ve been pointed in the direction of weathering powders, so I think I might investigate those next! So what else has been going on this week? 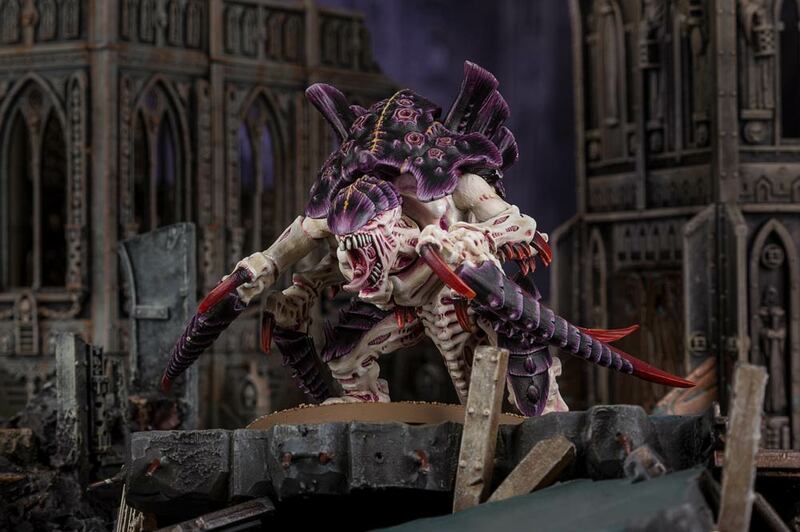 However, my current plan is to go with my own scheme, though different to the Carnifex above: pale blue body, and shocking pink carapace. I’m still not sure how I’m going to do any of that yet, but the competition isn’t being judged until 18 December (my birthday!) so I should have enough time to get something ready. That’s pretty much been it for progress this week! I’ve done a few odd bits, as always, but certainly nothing to write home about. For a few weeks now, it’s been all about the Alpha Legion – or at least, it’s felt that way! So I’m thinking about doing something different next, maybe turning back to some of the many Necron projects I still have ongoing. 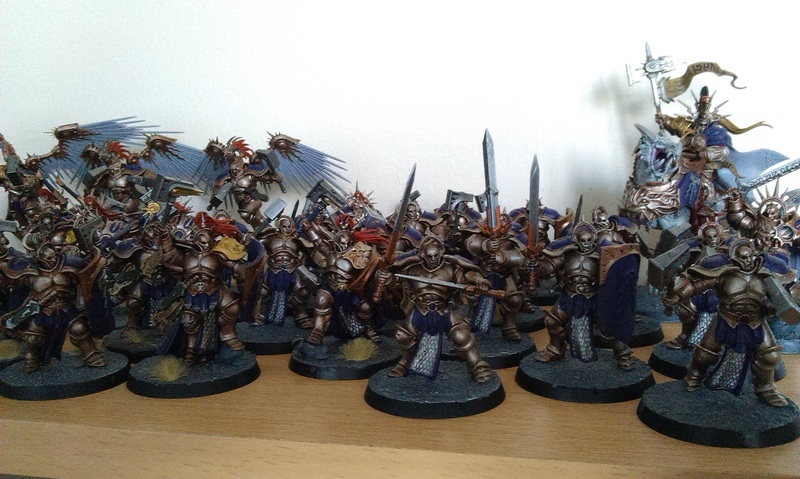 My legion currently stands at 1270 points with all the fancy upgrades and stuff, so is certainly getting there and all that! I’ve also been thinking about what to do next for that – I know I should do another tactical squad and get the minimum force org done, but I’m thinking instead of an all-flamer tactical support squad. I guess we’ll see! !